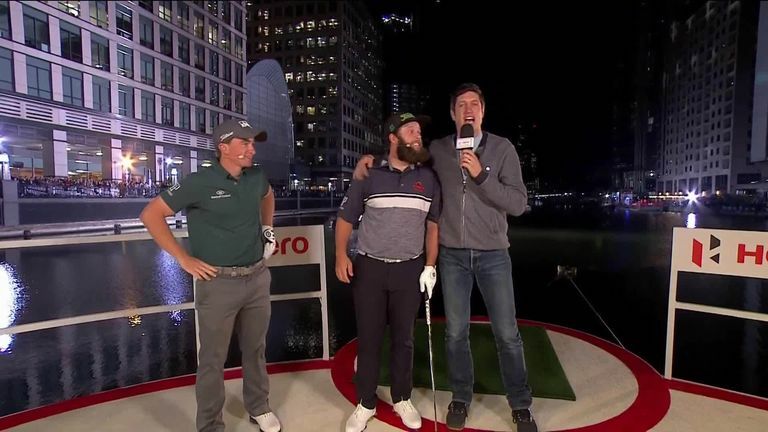 Six players took part in the head-to-head target-golf challenge towards a pontoon in Canary Wharf, with the players split into two groups based on their world ranking. Each player had six attempts to hit the floating island, with the top two players from each group moving on to the semi-finals. Group 1 saw Johnston pick up 20 points with the second of his six attempts and after Matt Wallace could only land one on dry land, it was left to tournament host Justin Rose to show his class - and he nearly holed his very first attempt to pick up 50 points - and his 90 in total was enough to move into the last four with Johnston. In Group 2, Thorbjorn Olesen looked to be heading out after his first four attempts found water before the Dane picked up 50 points with his fifth, enough to knock out his compatriot and Ryder Cup captain Thomas Bjorn, who put his first five into the drink before saving face with a 20-point shot with his last effort. That was not enough to see him through though because reigning British Masters champion Dunne landed two of his on dry land for 35 points. The first semi-final saw Rose up against Dunne and after a quick game of rock-paper-scissors to decide the order, the players alternated their efforts, with Dunne putting the pressure on by taking a 30-0 lead and although Rose responded with 15 points with his final shot, it was not enough. Johnston then joined Dunne in the final with his final shot against Olesen earning him a 30-15 win before a low-scoring final was won by Johnston's fifth attempt, which just held the 'green' for 20 points to seal the popular Englishman's victory.